Curtis Bean Dall (24 October 1896 - 28 June 1991) was a stockbroker, banker, investor, vice-Presidential candidate, first husband of Anna E. Roosevelt, and author. Curtis wrote three published works, but is most remembered today for his work F.D.R. : My Exploited Father-in-Law which claims a hidden One-World "internationalist" agenda for many of the policies put through under Roosevelt's presidency. You can purchase this book on Amazon here, here, or here. Curtis makes it plain in his book, that although he was on friendly terms with FDR and Eleanor, that he suspected they had some unsavory friends who weren't looking out for the best interests of the nation. One of these who comes in for a good deal of his attack was Louis McHenry Howe, a former journalist, who had hitched his wagon to FDR's star back before FDR became Governor of New York. Louis lived, at least part-time in FDR's household and when the family moved into the White House, Louis moved in as well. Curtis states that some of the people that Louis had in to the White House to meet Eleanor and FDR appeared to be "straight from the Soviet Union!" Curtis and Anna had "two tow-headed children": Anna Eleanor "Sistie" Dall on 25 March 1927, and Curtis Roosevelt "Buzzie" Dall on 19 April 1930.F Newspaper articles at this time show that Anna, "Sistie" and "Buzzie" were frequent visitors at the White House where a playground had been installed on the south lawn for them. Since Anna and her children were apparently staying days at a time in the White House with her parents, some tongues were wagging about the Dall's drifting apart. "Sistie" and "Buzzie" visit their father Curtis Dall, during a vacation April 1935 at White Sulphur Springs, West Virginia Grace Tully in her book F.D.R. My Boss states in passing "When John and Anna lived in the White House..." so they evidently lived there together at some point, perhaps just after the marriage, or even just before it! Slightly later however, John, Anna and the two children lived in New York. A rather long article about Anna occupied half of page 4 in the 30 Jun 1936 issue of the Waterloo Daily Courier. John and Anna moved to Seattle in the latter-half of 1936 "...where he became manager of a Hearst-owned newspaper. "M Her two children joined them, just after Christmas. The newspaper was identified in a May 1937 article in the Nevada State Journal as the Seattle Post Intelligencer, for which John was the publisher and Anna the "women's editor". By John, Anna had her third child John Roosevelt Boettiger on 29 Mar 1939. In a 1944 article, Curtis Jr is called "Curtis R Boettiger", but in 1949 here he appears again as "Curtis Dall". Finally Leonard Lyons (NY Post Syndicate) reporting in The Times of San Mateo 3 Jan 1950 : "F.D.R. 's grandson 'Buzzy' whose name first was Curtis Dall Jr., and then was changed to Boettiger, will be known henceforth as Curtis Roosevelt." When Sistie married in 1948, her father Curtis Dall was not at the wedding and many articles falsely reported that the children took the name of their step-father when Anna remarried. In fact they are called "Dall" in many newspaper articles, at least until Sistie was 12 to 13 years old. Curtis married secondly 15 Dec 1938 "in the bride's parents home" in Haverford, Pennsylvania to Katharine Miller LeasP (1917-2000), daughter of "prominent and wealthy" Mr. and Mrs. Donald Stewart Leas. They had four surviving children: Katharine, Mary, Stephen and James (b. 1948). From this point, I see no more mentions of Curtis spending time with his first two children, although he expresses regret that they could not attend his second wedding due to their being in school in faraway Seattle. By 1944 his son is being called "Curtis R Boettiger". Additionally, when "Sistie" got married in 1948, Curtis was not in attendence. (see San Antonio Light, 8 Jul 1948, page 24) It would appear likely because of this that there was some kind of strain in, or even severing of the relationship. This would have apparently happened sometime between 1939 and 1944. Possibly Curtis' second marriage was the trigger. When Curtis Jr got married, some newspapers reported that Curtis Sr has been invited but was unable to attend. Dall became involved with the "...racist Right's ill-fated efforts at forming a third party..."S. In 1960 the Texas-based Constitution Party put-up retired Marine Corps Brigadier General Merritt B. Curtis for president. (see Logansport Pharos-Tribune, 25 Apr 1960, page 7, "Constitution Party Picks Its Candidates") Dall the then-editor of Task Force magazine in Washington, had his name put in for vice-presidential nominee, but lost to B.M. Miller. In 1962 in a hearing before Congress, Dall describes himself as "Chairman of the Board of Policy for Liberty Lobby." Dall testified in Washington in May 1963, in front of the Senate Finance Committee, and against President Kennedy's trade policies. Syndicated columnist Drew Pearson, in an editorial, 1 Jun 1963 (see Ogden Standard-Examiner) reports that "...Dall charged that Kennedy's trade policies were dreamed up by his 'political bosses and mentors' whom he identified ominously as 'the political Zionist planners for absolute rule, via one world government....[They] have gained the power to influence while remaining themselves in the shade..."
On 21 Jul 1964, the Advocate of Victoria, Texas reported that the "Constitution Party Seeks New Standard Bearer". It "threw open its presidential nomination to anyone who is willing to promote the principles of constitutional government." This happened because George Wallace withdrew his name as their favored candidate. Three people mentioned as possible candidates, were: "Curtis Dall of Philadelphia, national chairman...; P.A. Del Valle retired Marine Corps lieutenant general...; and W Frank Horne publisher". In 1966/7 Curtis wrote the book for which he is most cited today, F.D.R. 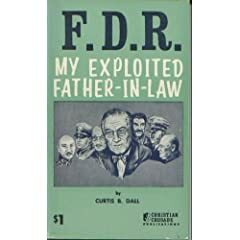 My Exploited Father-In-Law, in which he speaks of his ex-father-in-law, Franklin Delano Roosevelt and Franklin's relationship with, as Curtis saw them, the corrupt power of the banking elite of the time. On the back cover of this 1967 edition it states :"An ardent conservative Mr. Dall is a member of the Christian Crusade National Advisory Board; is a member of the Executive Board of 'We The People'; and works actively for conservatism in national politics." — Daily Capitol News (Jefferson City, MO), 15 Dec 1938, "Former Son-in-Law of Roosevelt to Wed Today" : "Haverford, Pa, Dec 14 — (AP) — Curtis B. Dall, divorced husband of President Roosevelt's daughter Anna, will be married tomorrow to Miss Katherine Miller Leas, daughter of Mr. and Mrs. Donald Stewart Leas. Announcing wedding plans, Dall said he regretted "Sistie and Buzz," children by his former wife, "could not be present at the ceremony owing to their being in school in faraway Seattle." Dall's son and daughter live with their mother, now the wife of John Boettiger, Seattle newspaper publisher. Dall is a New York broker." — Chester Times (Chester, PA), 16 Dec 1938 "...were married yesterday...", "...upon their return will reside in New York..."
"Katharine Dall Steps Up for Liberty"
This page was last modified on 25 January 2010, at 00:36. This page has been accessed 546,929 times.